Local Notices to Mariners and Marina Information. Race Officer and Sailing Instructions. The Club was founded in the 1930's and has during the period occupied several clubhouses. The current one being built in 1966 to provide all the facilities needed of an active sailing club. There is a large galley area with all the usual changing facilities down stairs whilst upstairs is a large lounge and bar with spectacular views from the verandah over Lawling creek and out to the River Blackwater with all the beauty of the salt marshes and bird life. The club grounds provide facilities for dingy & tender parking and winter storage for the keelboats and cruisers. The area of Lawing creek in front of the Clubhouse is reserved for the Clubs own moorings where most of the clubs fleet of keelboats are kept. The changing facilities etc are available at all times to the members although the galley and bar are normally only open on sailing days. The bar and lounge provide excellent facilities for the varied social programme which includes Club dinners, quiz nights, Barn dances, a very popular children's party at Christmas. Regular BBQ's are organised Saturdays after racing. The Keelboat fleet hold monthly "Nosh and Natter Nites" with specialist talks on boating matters. 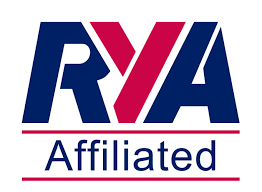 The Club offers a full sailing programme throughout the year for Dinghies, Keelboats and the cadet and novice fleet. The Winter and Frostbite Series are open events which have been run for many years attracting boats from other clubs in the area. The clubs fleet of four safety boats are used to accompany the dinghies whilst sailing. Go to the Sailing Programme section for full details. The main classes sailed in the dinghy fleets are: Fireball, Solo, Laser, Lark, Mirror, Kestrel, RS400. A keelboat fleet consists of mainly Sandhoppers and Hunter Europas. The cruiser fleet organise a number of short day or weekend cruises. Go to the Keelboat Fleet section for more information. The club has a very active cadet and novice fleet providing facilities not only the young to but also to adults wanting to start. There is currently a fleet of 19 Laser Pico's of which the Club owns three along with a number of other dinghies that are available for members to use. Races are organised within the area of the creek in front of the clubhouse. Go to the Cadet and Novice Fleet section for more information. This is the clubs annual "regatta" held each August providing a week of fun sailing the cadets and novice fleets, a series of races for the dinghies and keelboats are also run. The week has a packed social programme to suit all tastes. The event is well attended with many taking advantage of the grounds around the Club for camping. Every year the Club holds an open day in early spring to give you the opportunity to see the Club, meet the members and try a boat. Sailing is organised for all ages in dinghies and keelboats with experienced helmsmen.